Create titles for hanging files using your laser printer, inkjet printer or typewriter. Side-by-side folding design allows printing on both sides of the insert. Print top and bottom of insert in one pass, then fold in half. White background makes text jump out, resulting in clearly readable labels. Create titles instantly for hanging files using your laser printer, inkjet printer or typewriter. White background makes the text jump out, resulting in clearly readable labels for your files. 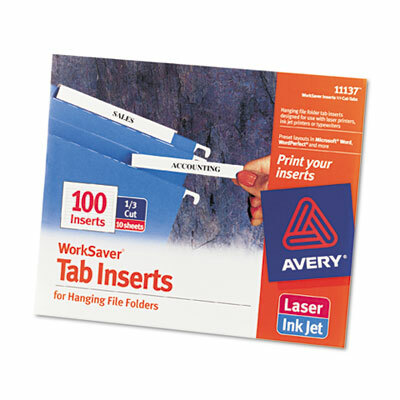 Easy to use with free Avery® templates and software. Side-by-side folding design allows printing on both sides of the insert; tabs not included. Finding the right hanging file folder will be so easy, it'll make your filing cabinet seem like an oasis of organization.